The Australian Bureau of Statistics reports that over four hundred thousand of us suffer an accidental injury every year. You deserve to be compensated after something unpleasant and unforeseen happens – but who’s going to help you? The one person you can always trust – you! With the help of Insuranceline. You deserve to be compensated after something unpleasant and unforeseen happens – but who’s going to help you? Accident Insurance Plus, arranged by InsuranceLine, provides a cash payout when you need it most. From only $2.54 per week you can be compensated if you suffer one of many common accidents. If you break your rib in a car accident, you’ll get cash – up to a thousand dollars If you badly burn yourself in the kitchen, you’ll get cash – up to two thousand dollars! If you fall and break your hip in the garden, you’ll get cash. Or if you break your jaw playing social footy in the park, you’ll get cash. Up to $2,000 in both these cases. And that’s in addition to any benefits you may receive from any other form of insurance. Cover from just $2.54 per week – that’s only 37c a day. Every permanent Australian resident aged 18 to 64 is guaranteed acceptance – even smokers – with no medicals necessary. Just a simple phone call to Insuranceline can get you started. And here’s the most amazing thing about Accident Insurance Plus. There are no limits to the number of times you can claim for minor accidents. If you break your arm falling off a horse – you’ll get cash. And if later on you break the same arm in a separate accident – you can claim again. With no penalty and no increase in premiums. 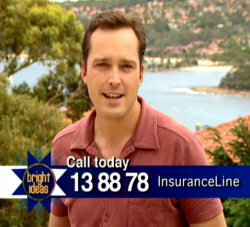 Accident Insurance Plus from only $2.54 a week for everyone aged 18 to 64. It’s also terrific value for families. Cover the whole family – 2 adults and 2 dependent children for just one dollar a day! And any more dependent children are included free! If an accident happens, you deserve compensation for your hurt and inconvenience. Especially if you’re laid up in bed and can’t work for a while, can’t drive or can’t do your own cleaning. Accident Insurance Plus will give you a lump sum cash payment when you need it most.